Mostly herbs or undershrubs, with or without stinging hairs. Leaves simple, stipulate, rarely exstipulate, alternate or opposite, often with dot-like or linear cystoliths. Inflorescence axillary, cymose or fasciculate, rarely flowers solitary. Flowers minute, usually greenish, unisexual (Plants monoecious or dioecious), actinomorphic, hypogynous. Calyx (3-) 4-5-lobed, often enlarged in fruit, rarely absent in female flowers; lobes equal or unequal, imbricate or valvate, rarely sepals free. Petals absent. Stamens (3-) 4-5, rarely solitary, antisepalous, generally inflexed in bud; anthers dithecous, dehiscence longitudinal; staminodes scaly or absent in female flowers. Ovary monocarpellary, free or rarely adnate to calyx, unilocular, uniovulate, ovule orthotropous, erect or ascending, pseudobasal, rarely apical; style simple, stigma capitate and mostly penicillate; pistillode present in male flowers. Fruit a monospermous achene or fleshy drupe, more or less enveloped by persistent membranous calyx. Seed albuminous, embryo straight. A family of about 45 genera and nearly 600 species; widely distributed in tropics, subtropics and temperate regions in all the continents. Acknowledgements: We are grateful to the United States Department of Agriculture for financing this research under P.L. 480. Thanks are also due to Mr. I.C. Hedge and Miss J. Lamond of the Royal Botanic Gardens, Edinburgh, for their helpful suggestions. Caidbeja Forssk. = Forsskaolea Linn. Freirea Gaudich. 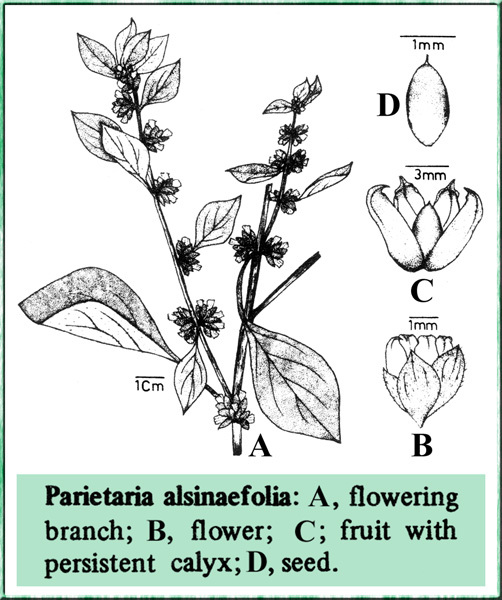 = Parietaria Linn. Gonostegia Turcz. = Pouzolzia Gaudich. Memorialis Buch.-Ham. = Pouzolzia Gaudich. Oreocnide Miq. = Villebrunea Gaudich.